This is not your normal cornbread! This corn bread has delicious and creamy sour cream inside of this. 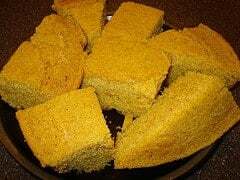 Sour cream adds a special touch to cornbread. Heat a lightly greased 8 inch cast iron skillet in a 400 degree oven for 5 minutes. In a bowl, combine all ingredients, and mix until all is moistened. Pour batter into hot pan. Bake in oven at 400 degrees for 20 minutes or until golden.